The Blue Yonder: TBY Rajasthan holidays "10 Incredible Eco Travel Destinations"
TBY Rajasthan holidays "10 Incredible Eco Travel Destinations"
One of The Blue Yonder's Rajasthan itinerary (explore the kingdoms of India) has been reviewed amongst the "10 incredible eco travel destinations" by Green Living. 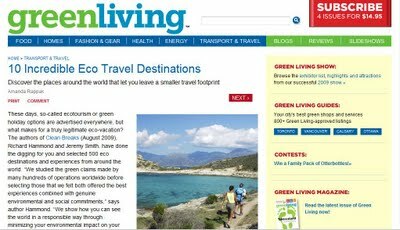 The selection is a further shortlist of 500 eco destinations and experiences selected by the authors of Clean Breaks (August 2009), Richard Hammond and Jeremy Smith, from around the world. 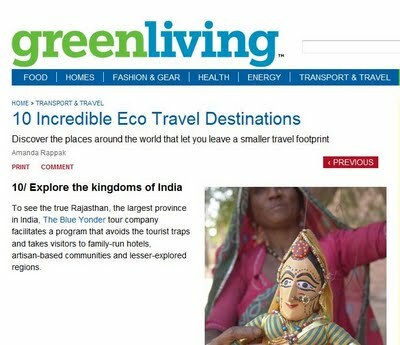 "To see the true Rajasthan, the largest province in India, The Blue Yonder tour company facilitates a program that avoids the tourist traps and takes visitors to family-run hotels, artisan-based communities and lesser-explored regions". "These days, so-called ecotourism or green holiday options are advertised everywhere, but what makes for a truly legitimate eco-vacation? The authors of Clean Breaks (August 2009), Richard Hammond and Jeremy Smith, have done the digging for you and selected 500 eco destinations and experiences from around the world. "We studied the green claims made by many hundreds of operations worldwide before selecting those that we felt both offered the best experiences combined with genuine environmental and social commitments," says author Hammond. "We show how you can see the world in a responsible way through minimizing your environmental impact on your journey and at the destination - by choosing carefully how you travel and the nature of places that you stay at. We also hope to show how you can have a positive impact in other ways - by contributing to the conservation of wildlife and local heritage and supporting local economies." We suppressed our wanderlust to pick just 10 of their incredible sustainable vacation ideas to share with our readers. Here's a snapshot of what's awaiting you, so start packing and get out there. It's good to see that your non Kerala itineraries are also gaining recognitions. Looking forward to explore India more with you guys some time soon.